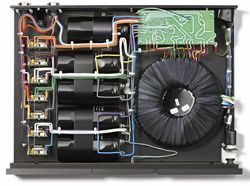 Naim Audio upgrades power supply range | What Hi-Fi? Naim Audio has announced an upgrade to its extensive range of outboard power supplies. Everything from the HiCap power supply upwards benefits from a change of internal voltage regulators. A voltage regulator is an electronic component designed to maintain constant DC voltage regardless of fluctuations in its supply voltage and current draw from its output. The new regulator is an in-house design that has been under development for two years . It uses discrete components for better performance, and the new design delivers a faster response time and lower noise than the component it replaces. The prices for the upgraded DR-spec outboard power supplies are as follows: 555 PS £5,725, XPS £3,355, NAC 552 preamp (including 552 PS) £17,540, SuperCap £3,795 and HiCap £1,195. Units shipped from Naim after 1st February 2012 (outside the UK) and 1st March (in the UK) can be upgraded at a special price: 555 PS £386.68, 552 PS £622.25, XPS £321.72, SuperCap £503.28, HiCap £170.36. Older units can be upgraded from October/November. Prices for these updates haven’t been released as yet.